A group of some 20 resplendently-dressed individuals filled a Victorian-themed London pub for the inaugural social of the Dandy Drinking Club on Friday, April 14. The event was held at Mr Fogg’s Tavern in Covent Garden, a venue styled in homage to the famous – if fictitious – gentleman explorer. The society was formed with the united aim of celebrating traditional menswear and included a large female contingent, one of whom won the best-dressed prize of a silk cockade handmade by the club’s founder and costumer Jonny Haart. The prize cockade alongside Costume Rag sample pamphlets. While most attendees recalled how en route their most common interruption was tourists asking for directions, the pub’s broader and more modern clientele received the group warmly as a few top hats and tricorns queued for drinks at the bar. 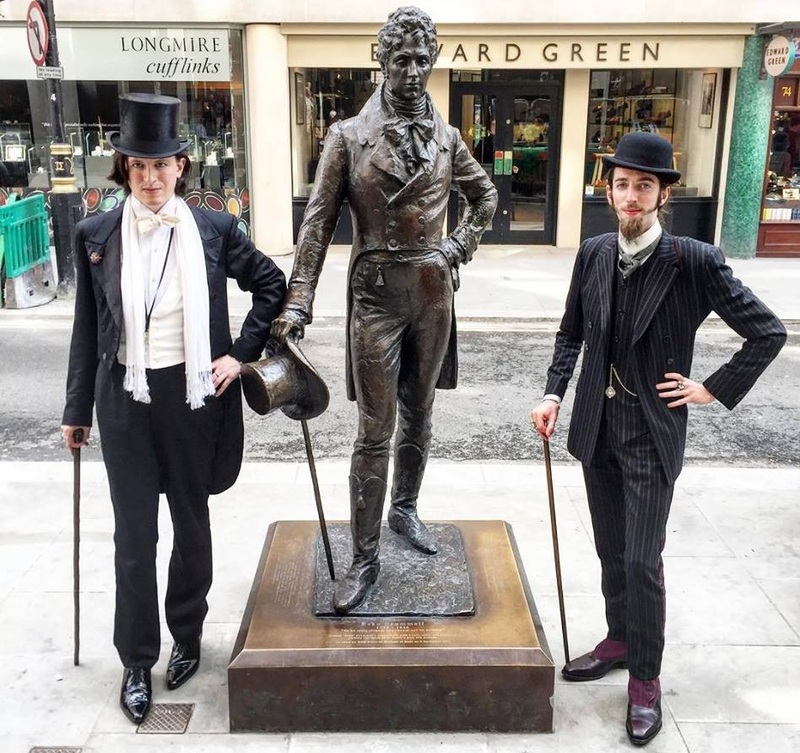 The next day a few remaining dandies – who had broken with tradition in respectfully retiring for the night – took to Jermyn Street to pay homage at the statue of George “Beau” Brummell who revolutionised men’s fashion in the regency period by breaking away from loose silks and encouraging the form-fitting silhouette of tailored wool. Nevertheless despite his words that to be truly well-dressed one should go unnoticed, these perhaps more flamboyant gentlemen were lured into New and Lingwood by luxury silk dressing gowns and a sparkling Pasotti skull-topped umbrella.